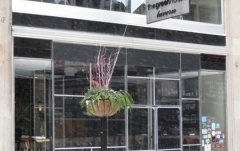 NorthCoast Awning has installed winter stationary curtains for three well-known restaurants on East 4th Street in Downtown Cleveland, Ohio: House of Blues, Greenhouse Tavern and LaStrada. These winter curtains have clear panels blending in nicely with the existing restaurant storefronts, while protecting the entrance from the harsh winter weather. 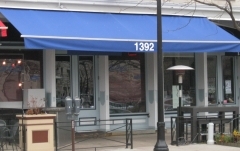 NorthCoast Awning has designed and installed two new rigid awnings with Sunbrella Black acrylic covers and winter curtains for SOHO Kitchen & Bar located on West 25th St. in Cleveland, Ohio. 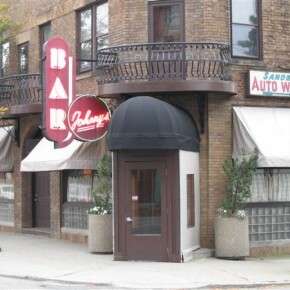 This awning project was completed under the City of Cleveland Storefront Renovation Program, which NorthCoast Awning is proudly certified to participate in. 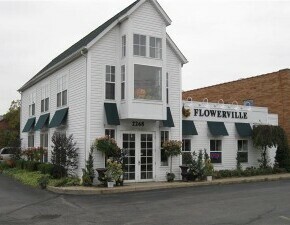 NorthCoast Awning recently recovered 12 rigid door and window awnings with Sunbrella Spruce acrylic fabric at Flowerville located on Warrensville Center Rd. in University Heights, Ohio. 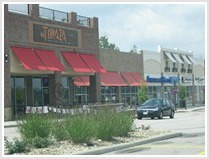 NorthCoast Awning is pleased to announce that it has completed the design and installation of three new 14-foot rigid awnings over the eastside patio at Zoup! on Aurora Rd. in Solon, Ohio. 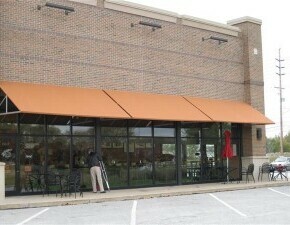 The awnings were covered in Sunbrella Nutmeg acrylic fabric and the owner is very pleased with the new look of Zoup! NorthCoast Awning designed and installed 2 new rigid awnings with Sunbrella Black acrylic fabric with logo graphics for Sacred Hour and a new convex awning with a unique Metallic Silver vinyl cover and graphics for Renuvo Salon. 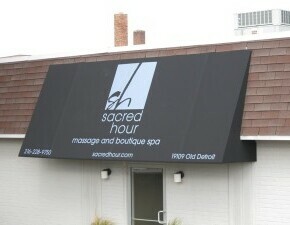 Sacred Hour is located on Olde Detroit Rd. and Renuvo is located on Ingersoll Rd. in Rocky River, Ohio. 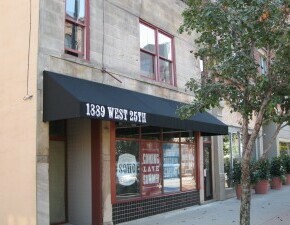 June 2011 NorthCoast Awning moves into its new location at 2635 Hamilton Avenue, Cleveland, Ohio. “I am excited about this facility in Cleveland. It is centrally located so that we can conveniently serve our clients throughout Northeast Ohio,” -Todd Krupa, President.